I created a new ice cream cake for our last Fun Run meeting a week ago. We have been meeting once every month since January and in previous years we always had coffee and treats at the final meeting. I think they forgot about that since I was the only one that brought anything. 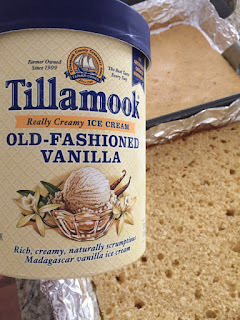 Totally fine since I had to use up more ice cream! 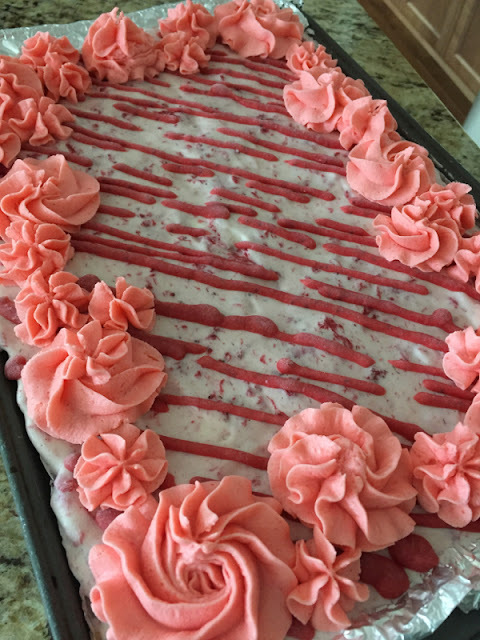 My latest ice cream cake creation has me using fresh strawberries, lemon goodies, and 1 1/2 tubs of vanilla ice cream. 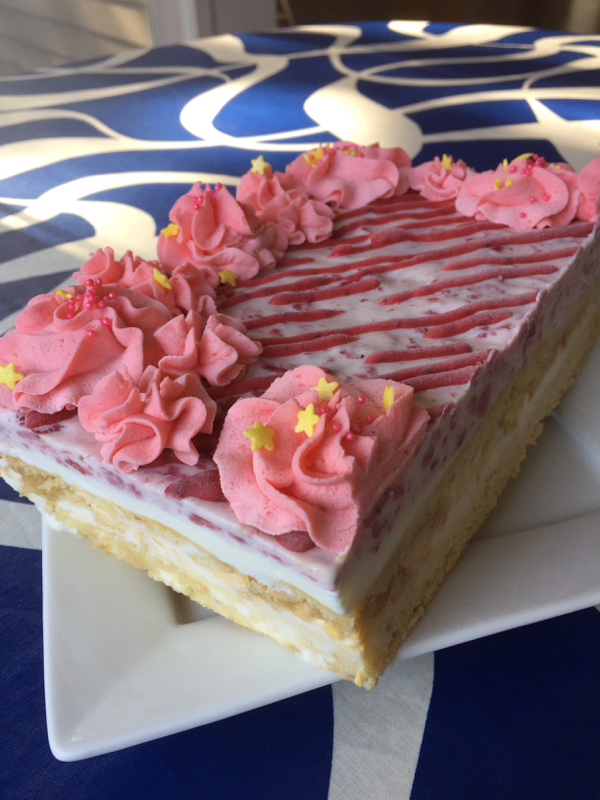 It's been a very warm Spring and I couldn't think of a more perfect ice cream cake to make. 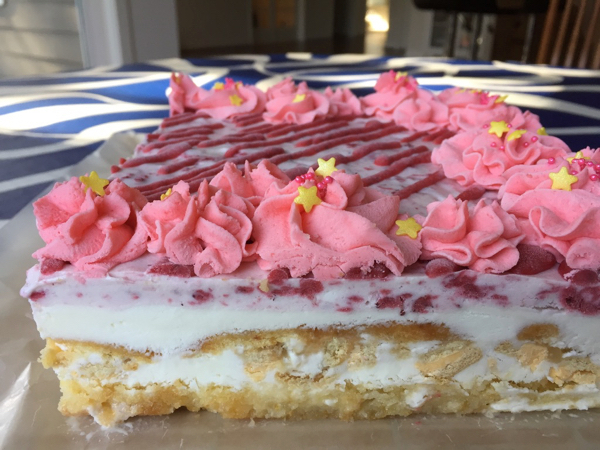 I have lemon and vanilla layers below and end with strawberry on top. I had plenty of lemon stuff to give it that tang and sour goodness so I had no need of any fresh lemons. It had just the right amount of lemon flavor in it. The strawberry flavor was not as strong but definitely present. I prefer more lemon than strawberry anyway and the cake as a whole wasn't overly sweet. I loved this balance but feel free to tweak it if you prefer more strawberry with just a tint of lemon. Cook and reduce strawberries until it thickens. Cool then store it in the fridge. 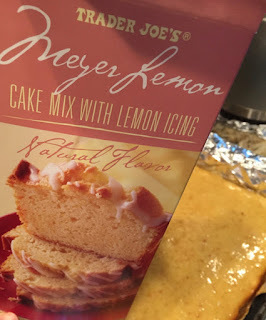 Bake lemon cake, cool and drizzle 1/2 of lemon glaze onto the cake. 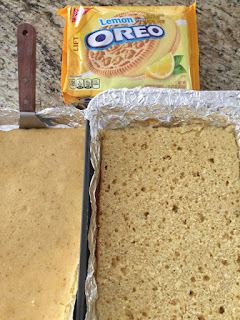 Slice cake in half horizontally so it's not so thick. 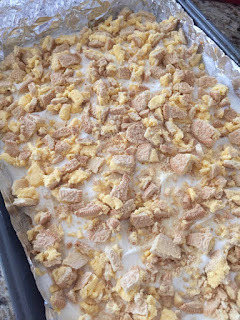 Line the pan you baked the cake in with new parchment or aluminum foil before assembling. This makes it easy to remove the cake later. Start the cake by laying 1/2 of the cake onto the parchment paper. Then add 1/2 a tub of vanilla ice cream. 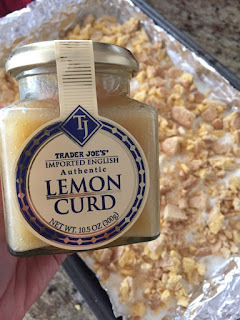 Top with a layer of crushed lemon oreos and spread on 1/2 a jar of lemon curd. 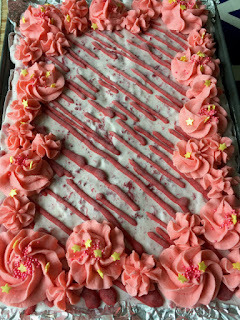 Top with the other half of the cake. Spread on 1/2 a tub of vanilla ice cream. Place the cake back in the freezer for a few hours. Mix the remaining 1/2 of the lemon glaze from the cake into the cooked strawberries. That should sweeten it just a bit and give it a slight lemony flavor. Mix 1/2 of the strawberry mixture into 1/2 a tub of vanilla ice cream to make strawberry ice cream. Spread this onto the cake and freeze for a couple of hours. Puree the rest of the strawberry mixture. Drizzle some of this puree onto the cake. Freeze. Add 4 tsp of water to 1 tsp of gelatin, mix and then microwave for 30 seconds. Mix until it's dissolved. 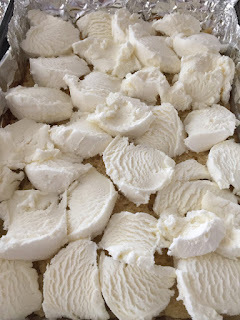 Whip the cold whipping cream until soft peaks appear and add 1-2 tbsp of sugar. Add the gelatin and whip. Add a squirt of strawberry flavored oil. 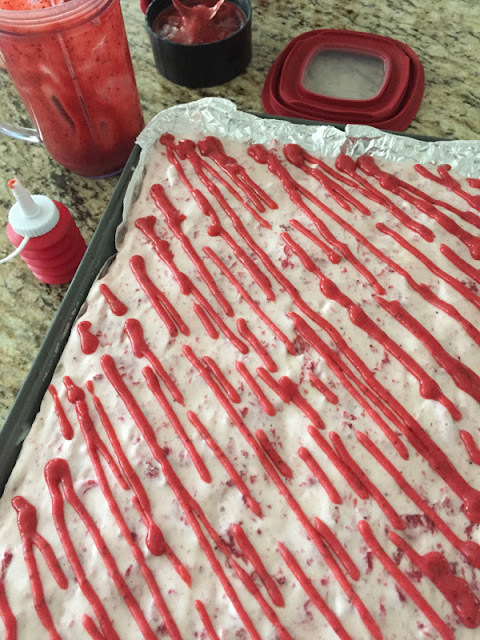 Add a drop of red food coloring and whip. Pipe the stabilized whipped cream onto the cake, staying away from the edges. Add sprinkles if you wish. Freeze for a couple of hours. 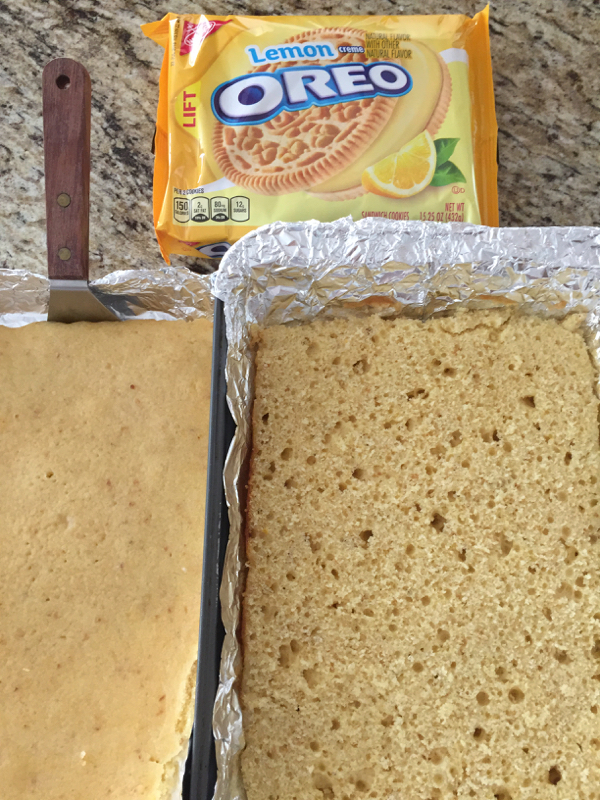 When presenting, slice off the uneven edge all around the cake and then remove the cake from the parchment paper. 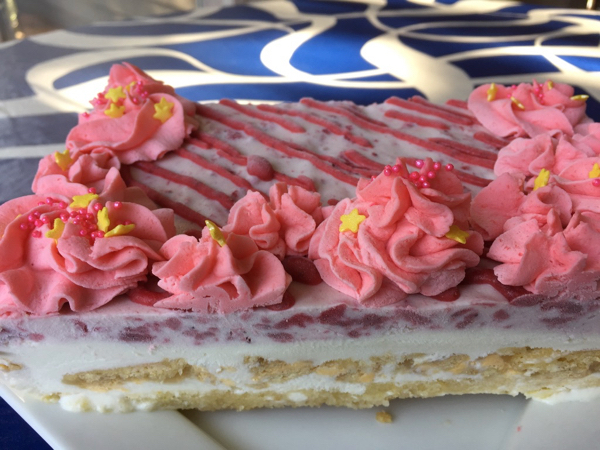 The cake is gorgeous when you reveal all the layers inside like this :) Enjoy!